More than two millenniums later, the troops came aground. 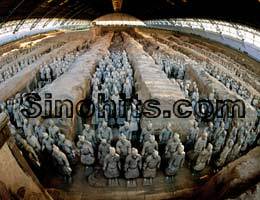 The terra-cotta warriors and horses, located in Lintong District, Xi¡¯an of Northwest China¡¯s Shaanxi Province, are a large set of well-organized life-size pottery soldiers and horses buried underground escorting the Qin Shihuang Mausoleum. The excavation, which is considered China¡¯s greatest archeological find in the 20th century, was made when a group of peasants were digging a well, and found fragments of terra cotta in March 1974. This site was named Pit One, and the later two sites excavated were respectively named Pit Two and Pit Three. 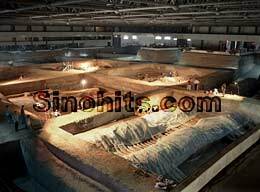 Pit One is 230 meters long, 62 meters wide, and about five meter deep, in which there are more than 6,000 warriors and horses. The phalanx vividly reveals what the army was like in the Qin Dynasty (221-206BC). Standing in front of them, you can still feel the momentum of troops who beat the other six kingdoms and united the country. Pit Two has more than 1,000 warriors, horses, chariots, and cavalries. 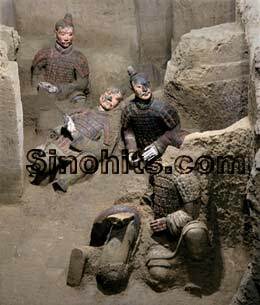 Pit Three refers to a small pit of more than 60 terra cotta warriors where the commanders stay. Because of technological deficiency, the colors of terra cottas faded not long after the excavation. To better protect the site, further excavation has been stopped. The site is was enlisted as World Heritage by UNESCO in 1987.